Cronuts (deep fried croissant shaped like a donut) can be easily made using store-bought crescent dough, such as Pillsbury Crescent Rolls. Roll it out and fold it a few times to get some height to it. The video below helps a lot for instructions when folding and cutting out the dough. It's great as a tutorial for making cronuts altogether. For cutting the dough, use a large cup and a shot glass if you don't have any biscuit cutters. Heat oil in medium to large pot with an oil thermometer (see video). You can also use a portable deep fryer if you have one. Those could save oil readily for future reuse for other fried food, such as breaded clams, french fries, chicken wings, etc. Boil-fry each side of the cronut for 1-1.5 minutes. 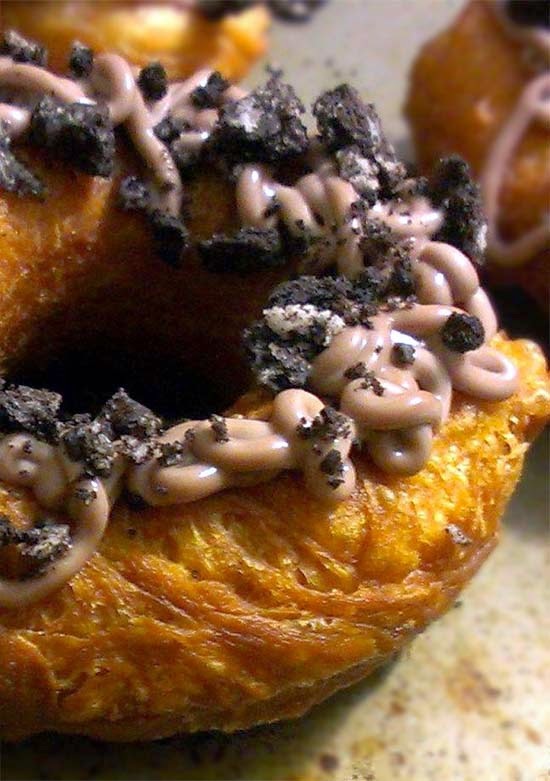 Remove cronuts and let it cool down while at the same time, draining oil out of it. My set up is simply a cooling rack placed upside down on top of brown paper bags or a stack of paper towels. The upside down cooling rack lifts the cronuts from the oily paper surface. so that cronuts are less greasy. 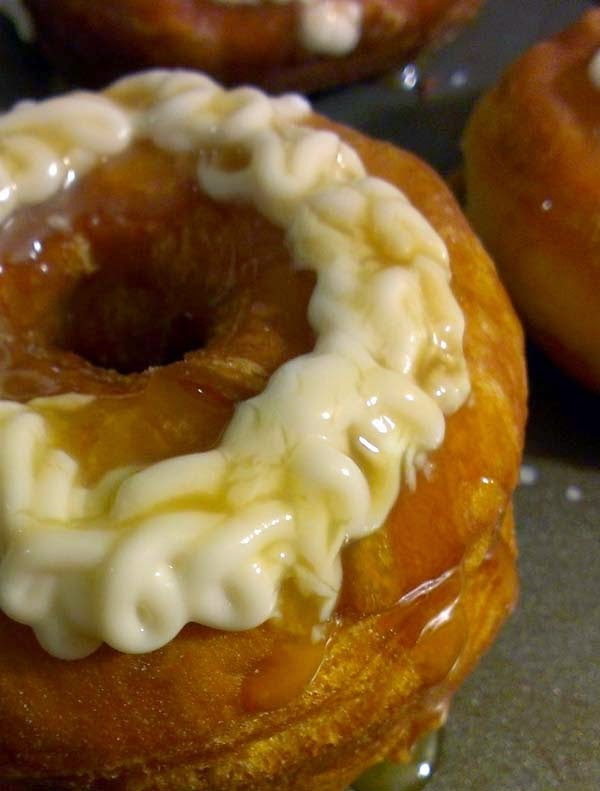 While the cronuts are cooling, you can mix the pudding toppings according to instructions. When ready, pipe the topping onto the cooled cronuts. If you don't have a piping kit, a plastic bag with a small snip on one of the bottom corners will suffice. For the chocolate pudding (top picture), crumbled Oreo cookies have been sprinkled as garnishing. For the vanilla pudding (below), a layer of caramel syrup and sprinkling of sea salt have been used to finish the design. You're encouraged to be as creative as possible. For this batch, I spotted the sea salt and caramel syrup in my cupboard and impulsively used them. Originally, I was just going to sprinkle crumbled Oreo cookies.